GRINNELL, Iowa – -(AmmoLand.com)- This weekend, professional football fans celebrate the biggest game of the year. Brownells, on the other hand, is giving liberty-loving Patriots something else to celebrate – the chance to win an enormous barrel full of 13,889 rounds 5.56mm NATO Hornady Frontier 55-grain M193 ammo. 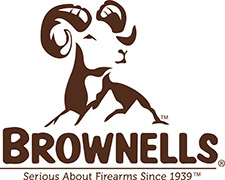 Starting at 12:01 AM Saturday, February 2, and going through 11:59 PM Sunday, February 3, free-ammo seekers are encouraged to look to the Brownells Ram as their guide. Sign up for a chance to win the barrel full of Hornady ammo at www.brownells.com/superbarrel. One lucky winner will be drawn by random on Monday, February 4th, 2019, and will receive the big red barrel full of ‘Merica valued at $4,239.99. Containing enough freedom seeds to fill approximately 462 standard-capacity 30-round AR-15 magazines, the barrel is perfect for starting a home-based ammo dump, serving as a unique coffee table, or triggering interesting conversations with all who cast their astonished gaze upon it. To learn more or sign up to win the big red barrel of freedom and other amazing products, visit www.brownells.com. When are they going to draw the winner, and how do we know or find out who the winner is? Will they announce it or just private email? I think this is a setup. I can’t log in and I don’t think Brownells is running a fair reffel. I will not be doing business this company! Me too. Site had an old email address. Ive been using Brownells for 35 years. You need it they probably got it! Great people and service. I am a regular recurring customer. Always satisfied and happy with my products. super barrel link entry form doesn’t work. IN a web browser to find the contest. Hornady ammo has always been great for me. Yes sir I need that barrel of ammo!!!! Ammoland this is a great prize .I receive your specials often ,some lucky person will enjoy this prize. Love to go shooting when I can afford the ammo winning this would make it a every weekend of enjoyment.